Rocket blasting through the stratosphere or train wreck back down on earth? 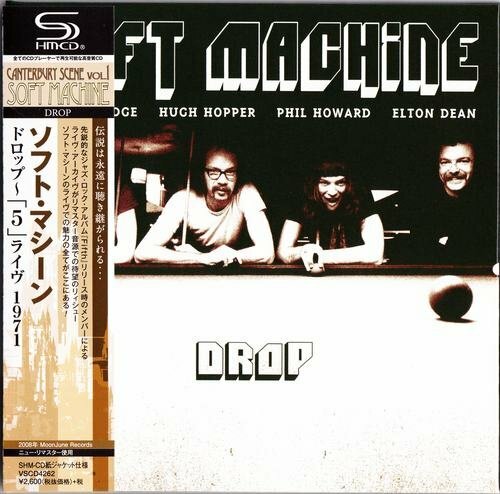 Truth be told, Drop is probably somewhere in the middle; no reasonably well-recorded live Soft Machine CD featuring Mike Ratledge, Hugh Hopper, and Elton Dean -- and that's what Drop is -- will be an unmitigated disaster. But as might be expected, Steve Lake's liner notes for this set, recorded on a German tour in fall 1971 and released on the Moonjune label nearly four decades later in the waning days of 2008, suggest that the version of the band heard here, featuring Phil Howard as a replacement for Robert Wyatt on drums, streaked across the sky rather than tumbled off the tracks. Howard was retained in the drummer's chair for only half a studio album back then (Fifth, recorded a short while after the music heard here), and Lake seems to feel that a potential exciting direction went unrealized due to Howard's early forced departure. Well, perhaps with Howard as drummer for a while longer, Soft Machine could have realized a wilder and freer form of expression instead of "the shelter of compositional structure and arrangements," as Lake puts it. Then again, maybe the most appropriate reaction to Howard's nearly immediate replacement by John Marshall (playing on the other half of Fifth, and everything that came later) would be a collective sigh of relief (even though Elton Dean's dissatisfaction with this state of affairs signaled his departure from the group as well). Those believing the progress of "jazz" can be broadly summarized as leading from structure to freedom might -- assuming that Soft Machine had fully transformed themselves into a jazz group by this point -- view Drop as the apotheosis the Softs as jazz musicians. But even "free" drummers are not unfamiliar with the notions of subtlety, nuance, and playing with others as opposed to against them. A tornado of activity to be sure, Phil Howard crashes and bashes nearly nonstop here, his omnipresent ride cymbal washing across nearly everything, the drummer often seemingly oblivious to keyboardist Ratledge, bassist Hopper, and even saxophonist/keyboardist Dean, his supposed free jazz comrade-in-arms -- not to mention the pesky "compositional structure and arrangements," most of which came courtesy of Ratledge. Yes, the versions of "All White," "Drop," "M.C.," "As If," and "Pigling Bland" (which would later appear in more restrained fashion on Fifth) and "Slightly All the Time" and "Out-Bloody-Rageous" (from Third) are filled with fiery energy and some of the most committed playing the Softs ever put on tape (some particularly ear-shattering, note-bending stuff coming from Ratledge), if "committed" means essentially the same thing as "intense." By that measure, Drop is a resounding success. A contrary viewpoint might be supported, however, by comparing Drop to the Live in Paris two-disc set on Cuneiform, recorded after Marshall replaced Howard and featuring (on disc one) five numbers in exactly the same order as they appear on Drop. Substitute Marshall -- a more rigid timekeeper but playing the changes instead of steamrolling through them -- for Howard and the musical result is akin to four people having a spirited dinner conversation versus three people in the dining room shouting to be heard over the clatter of somebody rummaging through pots and pans in the kitchen. Moonjune is to be commended for its archival Soft Machine efforts, not to mention many stellar releases in the post-Canterbury era by both old heroes and new artists who continue to brighten up the music world well into the 21st century. And completists may very well want to plug in a gap in their Soft Machine shelves by snapping up Drop, the one and only Soft Machine album featuring Phil Howard on drums from beginning to end. Others...proceed with caution. Dedicated to the memory of Elton Dean (1946-2006). Recorded live during the German tour in the Fall of 1971.